Archit Baskaran remembers the pressure he felt during his senior year of university. He had long been the emotional support for a friend who dealt with mental illness, he recalled. And while he said his friend eventually found professional help, Baskaran became anxious, withdrawing from relationships and having panic attacks, an experience he detailed in a blog post published in August. Baskaran said that while supporting his friend, he had put a tremendous amount of stress on himself. A therapist diagnosed him with post-traumatic stress disorder in 2017, he added. “The challenge I faced at the time was striking harmony between my own self-care and my desire to be a strong support system for my friend,” the now 21-year-old medical student said. But in the midst of his realization and recovery came “shakti,” Baskaran said. The Sanskrit word for strength and power, Baskaran said he rose from the “ashes of trauma” to become a stronger person. This past summer, Baskaran drew on his experiences to help build “I-AM SHAKTI,” a movement to help South Asian Americans face mental health challenges and share their stories. He co-founded the group, which celebrated its launch last month, with undergraduates and medical school students from Northwestern University and the University of Wisconsin-Madison. The program plans to share stories of individuals living with mental illness to show the South Asian American community that those issues exist, according to Baskaran. Outreach plans also include speaking at houses of worship and South Asian student groups. Eventually, the group hopes to create a national database of South Asian mental health professionals organized by language so people can find culturally competent care. Growing up, family friends saw Baskaran as a student on the road to becoming a doctor and a role model, he said. He added that those expectations made it more difficult for him to pursue help. The model minority myth and stigma surrounding mental health care can keep people from seeking treatment, according to Dr. Vasudev N. Makhija, a practicing psychiatrist and founder and president of South Asian Mental Health Initiative and Network (SAMHIN). Mental illness that is left undiagnosed or untreated can cause emotional distress and affect others, Makhija noted. He added that he has seen that some South Asians seek treatment when their issues are more advanced and severe compared to other patients. Makhija said some factors that can hamper access to care include affordability and difficulty finding culturally competent service providers. To address some of the community’s needs, SAHMIN has created a directory of South Asian mental health providers in New Jersey that speak Gujarati and Punjabi among other South Asian languages, Makhija said. According to the American Psychological Association, 1 in 2 Asian-Americans living with mental illness will not seek help due to language barriers. Data specifically for South Asian Americans is unavailable. Yoey Cheng-Nguy, a professor of psychiatry and behavioral sciences at the University of Southern California’s Keck School of Medicine, said that although more Asian-Americans overall are seeking mental health support, research has shown that they are still three times less likely to seek help for mental health concerns in comparison to their white peers. “As mental health clinicians, we often receive referrals from general health practitioners possibly because it is culturally more acceptable to seek help for physical complaints rather than mental health issues,” Cheng-Nguy said. Baskaran was diagnosed with PTSD in April, he said. During a family trip to Europe in July, he went through a relapse, he added. When he initially spoke to his parents about his diagnosis and challenges, they initially treated it as something he could fight and emerge from very quickly. “Religion, spirituality, and community became common motifs for mental health recovery — my family defaulted to values they grew up with in India as a means of helping me through my challenges being Indian-American here,” he said. As his parents continued to research PTSD and mental illness, he said they noted that there were very few stories on the web about Indian Americans and mental illness. His parents were trying to help him, he noted, but couldn’t find resources. “It’s almost as if mental health was deemed a ‘white person problem’ and not simultaneously a ‘brown person problem’ or a ‘South Asian problem,’” said Baskaran. With support from his parents and peers, Baskaran started to develop I-AM SHAKTI to help those currently going through mental health challenges or seeking resources to support others. 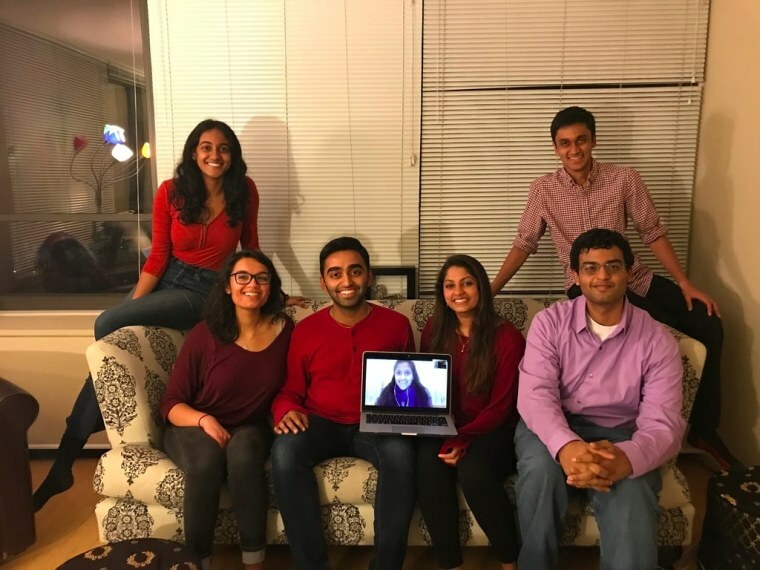 Nikita Saladi, a first-year medical student at Northwestern University, became involved with I-AM SHAKTI after spending time focusing on mental health research on adolescents and seeing Baskaran’s personal story online. Saladi said she had friends and family who dealt with mental illness, and felt anxiety that she would begin to become symptomatic herself.